So we have discussed the basics, shared some hints and tips, now its time for the meat on the bones. The part we all go to new places and cities for. The culture. The scenery. The architecture. The feeling of being scared out of your mind because your husband thinks its a “fun idea” to go 5000 feet up a mountain……more on that one later! Annnyyyway, I didn’t want to make this post days long, but I really struggled to get this post down to just 6 things, with its newer history, (some of The Sound Of Music was filmed here) its fame as being Mozart’s birthplace, something of note at every twist and turn in the city, and its sheer beauty. Salzburg has a lot to offer, but we got there. 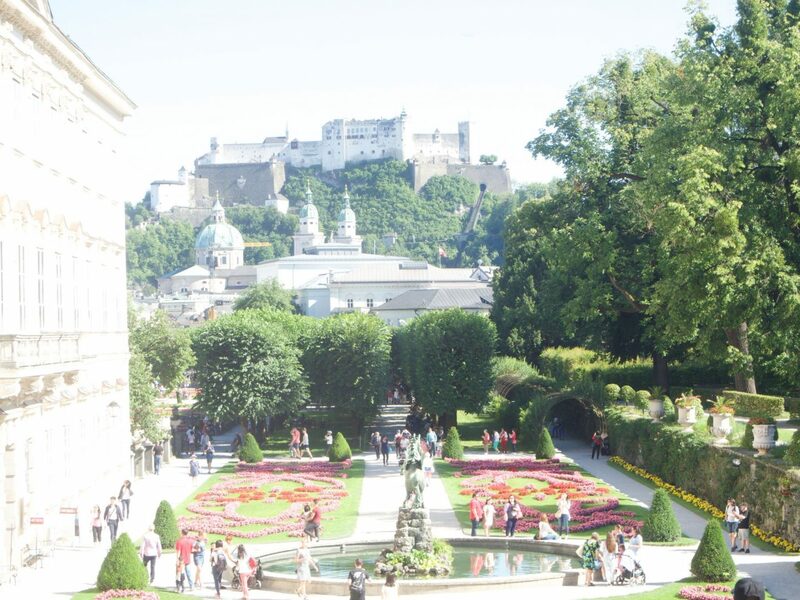 I present to you, along with lots of photos, my top six things to do in Salzburg. Ta-daaaa! 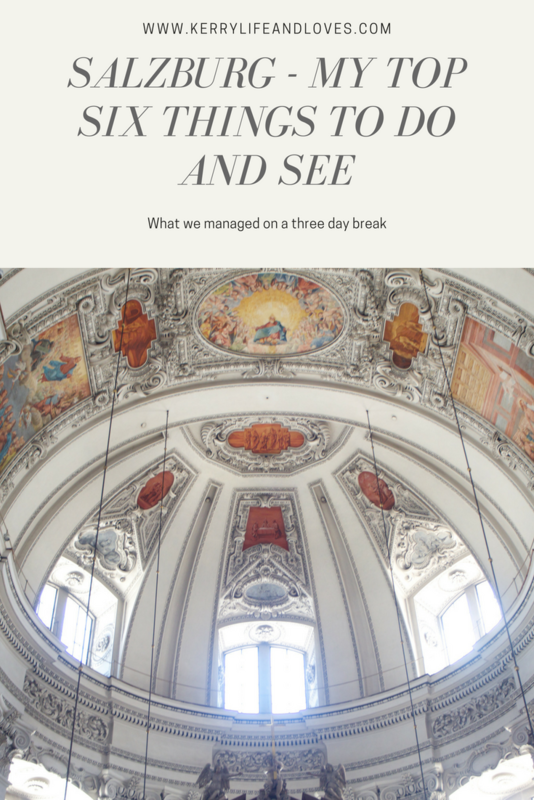 Oh and if you missed the post on the first part of this trip, here it is Mini Break in Salzburg, Hints, Tips, Budget and Basics. 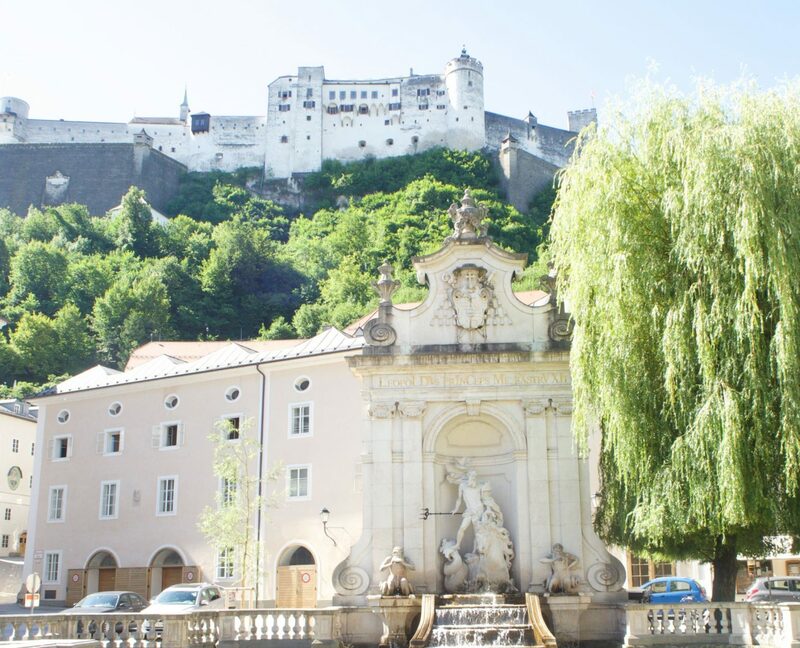 I thought I would start with some of the attractions that show the rich history that salzburg has, and some of the things you can do there that teaches you a little about it. Iv mentioned before that Nik and I are borderline history nerds, so we love anything that teaches us some history. You have so much in Salzburg. Literally every turn you make has something with significant historical value. I will then follow with you some of the beauty Salzburg has in abundance. I hope you enjoy! The fortress, one of the biggest in Europe and one of the only castles to have never been forcefully under enemy control , has so much to explore. The views, the architecture, the opulence, the total feeling like you are stepping back in time, make the visit to the castle a complete must see. We spent quite a bit of time up there, before walking back down (which was a gorgeous walk) to the city to explore some more. 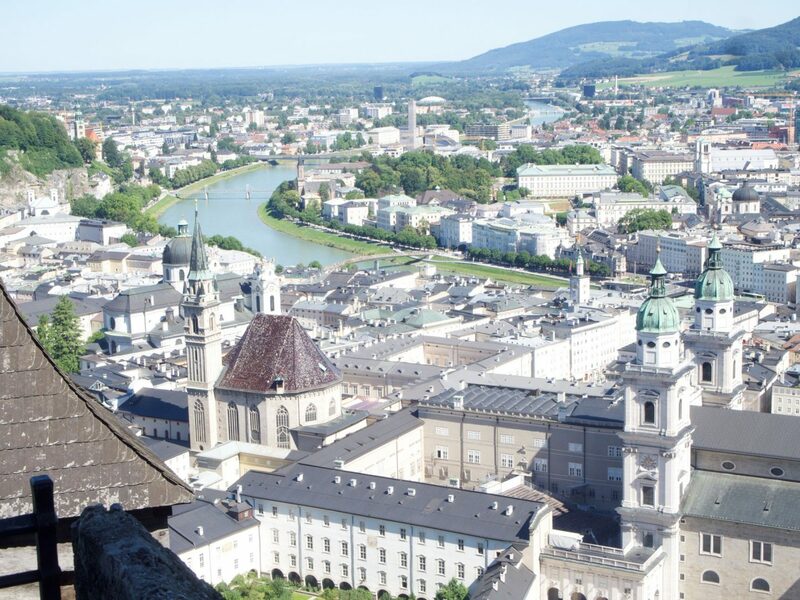 You cant have six top things to do in Salzburg without mentioning their abundance of the most beautiful churches and cathedrals. St Peter is the oldest monastery in the German speaking world, and is still in existence as an active brotherhood today. 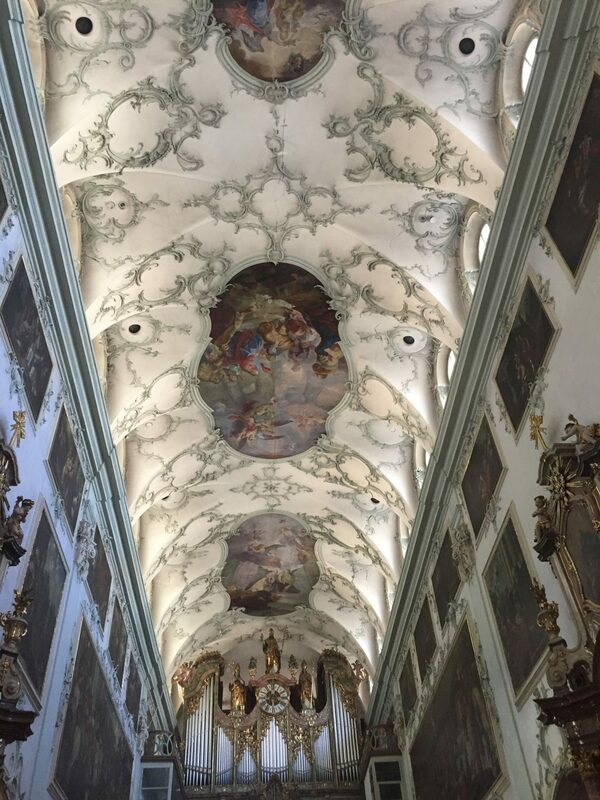 There are many, many churches, cathedrals and places of worship in Salzburg. I just adore old cathedrals and churches, so I was in my element. Now, a little known, probably surprising fact about me, I spent a few years when younger, going to Sunday school bible classes, my Mum has faith, (yet still swears like a sailor if we annoy her), so I was encouraged to go. I think my time at the Sunday School came to a fairly abrupt end when, aged 13, I turned up to a rounders match still drunk from the night before but that is a story (and a lesson learnt, don’t judge, I was head strong and finding my feet….) for another day…….. I still love the feeling of a church, still attend mass at christmas, and still feel that overwhelming sense of peace when in them. St Peters Abbey is literally breathtaking. As if often the case with old churches, the architecture is amazing and the inside just blew me away. Built in 1130, but with original origins dating back to the 7th century, the intricate and immensely detailed ceilings and paintings along the walls, are breathtaking. The interior really shows the era’s that the Abbey has gone through with Romanesque and Rococo styles very identifiable. Its just gorgeous. In the grounds surrounding the Abbey you have the beautiful cemetery and the catacombs, also both worthy of a visit. Lots of Austria’s much loved residence are laid to rest here, including scholars, composers, and Mozarts family. You can go into the Catacombs, (using your Salzburg card) and have a look. For those of you that loved The Sound of Music film, the St Peters cemetery is what the Trapp family ran through to find a hiding place in the dark before making their way into Switzerland. 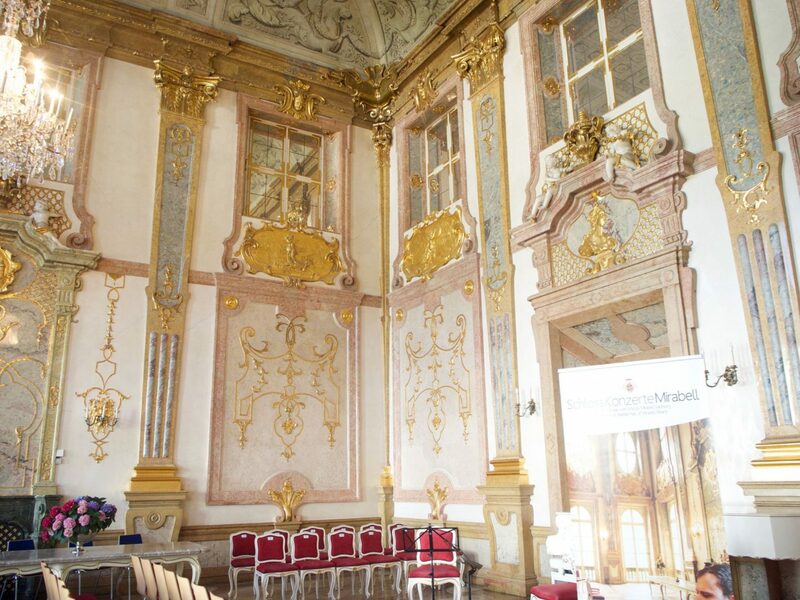 Now used as the offices for The Mayor of Salzburg and the City’s administrators, you can visit the marble hall and the staircase and appreciate their beauty. With its abundance of angel statues, marble pillars and decadence, it is now a very popular venue for weddings and concerts. We would have loved to have come to one of the concerts, we just ran out of time, so if you fancy it, allocate the time. Im sure it would be wonderful. The Gardens were improved and extended in 1690. They are gorgeous to walk round, but we found this to be the pace most full of tourists. It was pretty busy, but then the weather was beautiful, so this could have contributed to that. 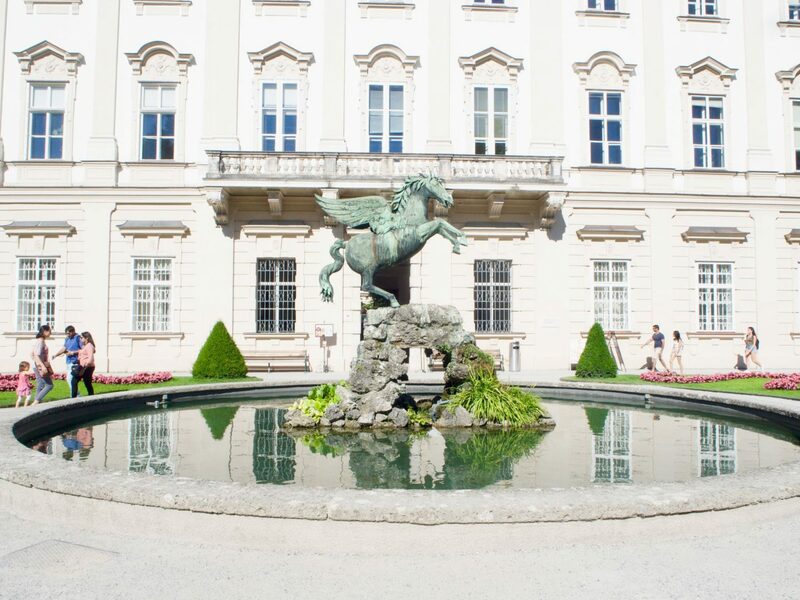 The gardens were again, a filming location for the Sound of Music, and the Pegasus Fountain in the grounds was where Maria and the children danced around singing Doh-re-mei. With its rose gardens, gorgeous planted arches and beautiful statues symboling the four elements of fire, air, earth and water, a visit to the gardens is a lovely way to spend an hour. 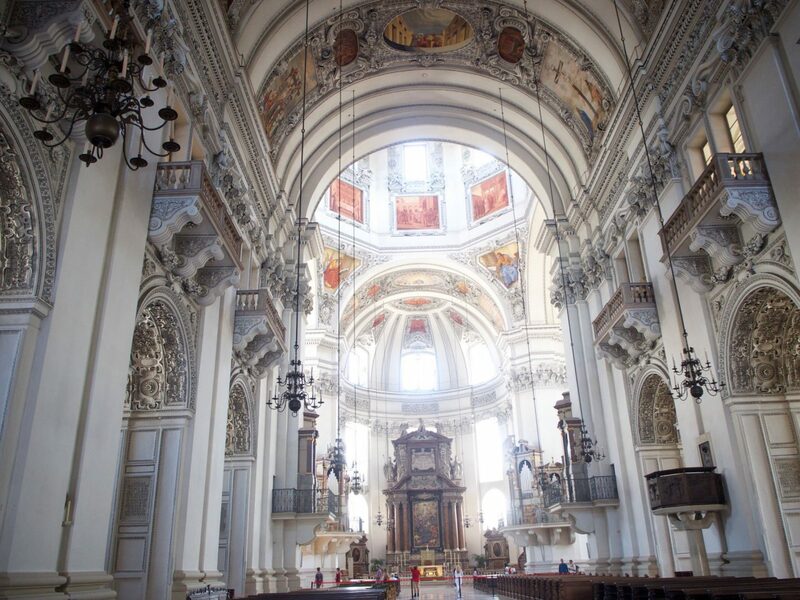 The beautiful cathedral of Salzburg is said to be Salzburg’s most sacred building. Originally built in 767, but then rebuilt in 1167 after a fire, it truly is magnificent. 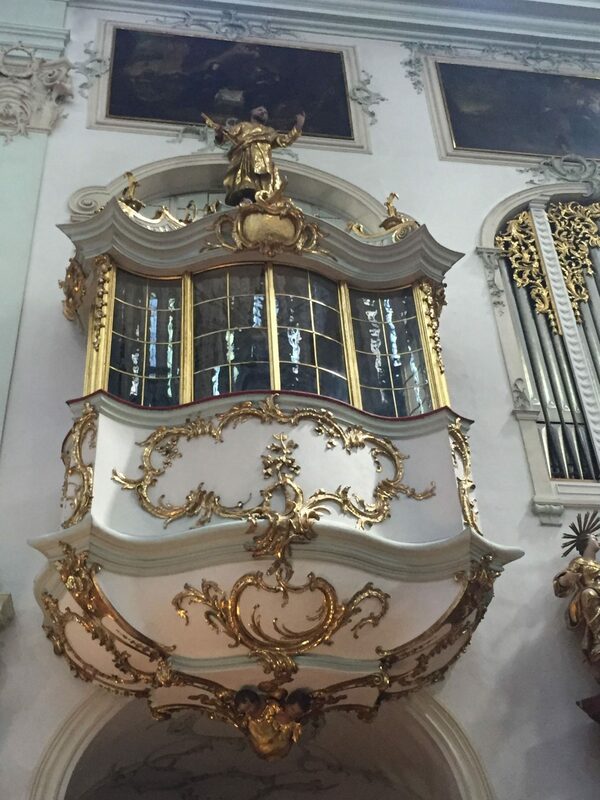 As the place where mozart was baptised, and then later the choir organist, it attracts many visitors. 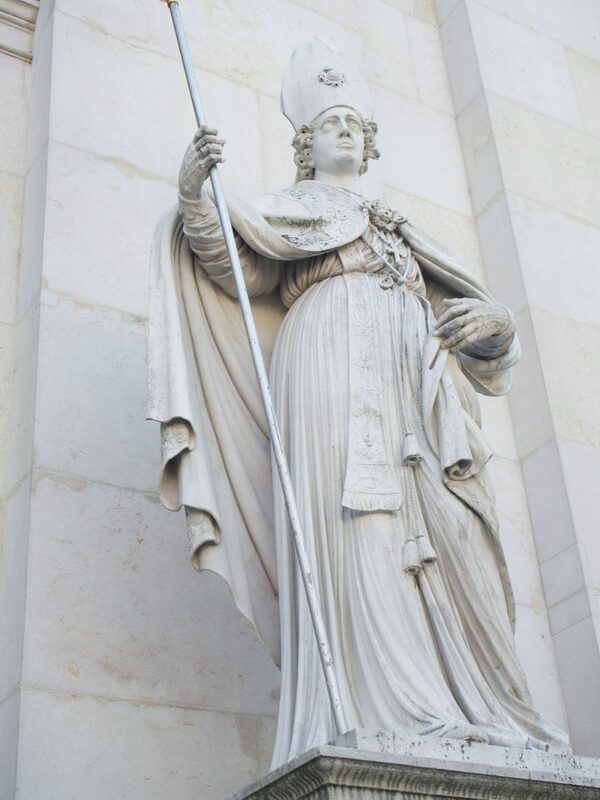 As you approach the cathedral you are greeted by four statues, looking down at you, or Saints Rupert and Virgil, as well as the apostles Peter and Paul. Like all cathedrals, when you walk into this building you are immediately hit with the feeling of calm, and the total beauty of the place. With its ivory coloured marble walls peppered with the most beautiful, colourful paintings and fresco’s. 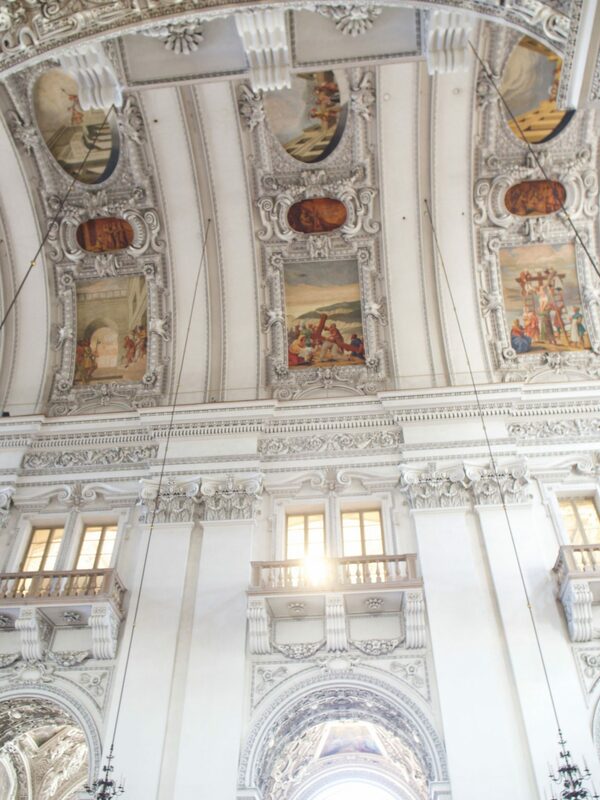 As you look up, there are two rows of frescos that tell stories from the old testament. The dome, which is the pride of the cathedral, is just breathtaking in its beauty. After lighting candles for our lost loved ones, we took a few moments to sit silently but together in the pews and take it all in, gather our emotions, reflect for a while and just be. It was a beautiful moment. Something to note; you can do a tour of the cathedral, which is the only way you get to go to the upper levels of the cathedral. I would have loved to have gone up there and seen the cathedral from that view. We didn’t know that you could do a tour, so if you want to see the cathedral from all angles, book the tour. You can also attend a Mozart Concert dinner at the cathedral, which again, is something that we would have loved to have done but ran out of time. A beautiful way to spend an evening so if it floats your boat, allocate the time. When you wake up in the morning and your husbands says, ‘Oh lets take the cable car up the mountain today’, your scared of heights self feels ok. I mean, its just slightly bigger than a hill right? We jumped on the bus (free with our Salzburg card) to where you get the cable car . The bus journey itself is really nice as you wander through the residential side of Salzburg and see how they live. 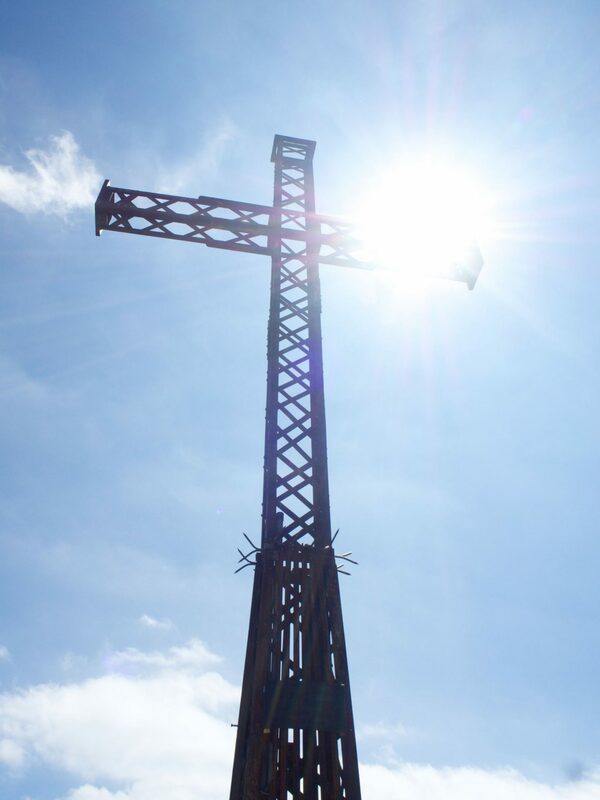 Anyway, as we rounded a corner, the friendly bus driver that had been chatting away with us the whole time, suddenly said ‘there, there is your mountain’ to which I looked up, and up, and up……. It was huge and I suddenly got scared!!!! Anyway, I wont bore you with my panic but I got on, I did the 9 minute cable car journey up the mountain (again, free with your card) and got out at the top. I am SO glad I overcame my fear, it was spectacular up there! The views, the change in air, the sheer beauty of seeing the Austrian Alps from above. Randomly, something I couldnt get my head around was the fact that there was a cafe at the top! I mean, that really is remote cafe isnt it! It was fabulous though as you could sit outside, get your air legs and just breathe it all in. Mount Untersberg, an absolute must to do in Salzburg. So, there you have it. My top six things to do. There are a couple of other things that we did that if you get time for, are a nice way to spend an hour. The little boat trip up the river is nice and the staff point out various points of interest etc. Also, over in the new town there is often live music. It does get busy but its fun. If we had more time, we would have gone to the Mozart Concert dinner at the Cathedral, visited the Eagles Nest (Hitler’s home in the mountains, its a half day excursion if you fancy it) and visited the Sound Of Music Museum. We just ran out of time. There is so much to do in Salzburg I think a week is needed haha! "Creating A Peaceful Hotel Style bedroom for better sleep"
"If We Were Having Coffee…"
Breathtaking photos Kerry. What a beautiful city and a trip to be remembered. I love a city break too, my last one was Venice which I instantly fell in love with and didn’t want to ever leave. We went for our 1st wedding anniversary in 2016 and I’m hoping to go back soon. Sounds like you had a fabulous time in Salzburg all round. Fabulous photos Kerry. 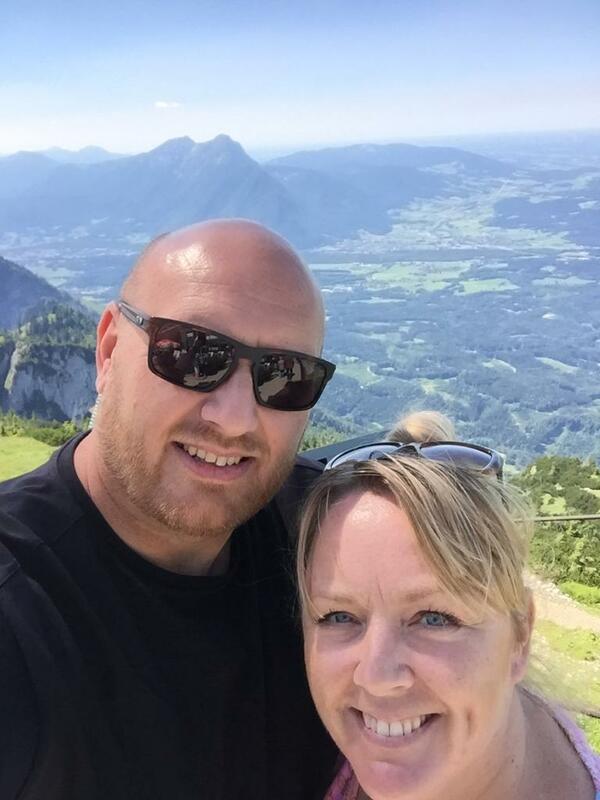 To be honest I’ve never thought of visiting Salzburg but it looks incredible and right up mine and Nick’s street with all the history too!! 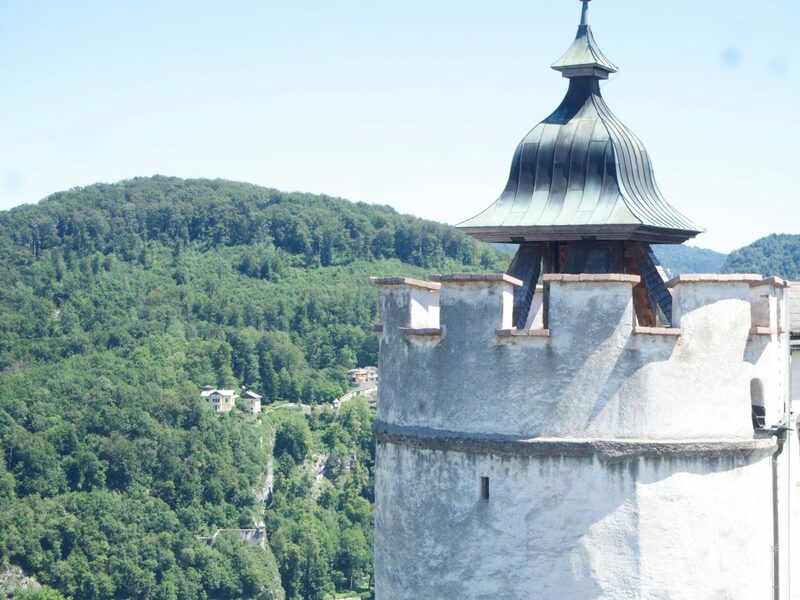 Lovely pics of some stunning architecture and features of Salzburg. It looks, and from your comments, sounds an amazing place to visit. Glad you had a wonderful time and thanks for an interesting post. I’ve been to Berlin, not a beautiful city but interesting nonetheless. Look forward to hearing about your trip to Cape Verde. Loved my visit too ! These photos are beautiful. I loved it when I went but would love to go again. Do they still have the large size chess board in the narrow back streets I wonder. It was so amazing, brings back lovely memories. I suggested a trip to Salzburg to my husband but he’s into Beethoven and not Mozart so doesn’t want to go. How can anyone not like Mozart!!! !